I mentioned in my last post about Going Places that there was an awesome “learning buzz” that happened as we worked hard and focused in on our building projects. Most of the kiddos were on task, planning, collaborating and creating for almost 3 hours! This was the first time this had happened (which now I realize might be because I haven’t offered many opportunities like this…but that’s for another time), and students noticed it. After we were mostly done, we gathered on the rug to talk about how things had gone–what worked well and what we would change for next time. As is usually true, the sides look pretty equal (as far the number of things that were mentioned). But what I know, because I was there, is that most students are represented by the items on the “plus” side of the chart. While it doesn’t mean the “deltas” aren’t important, it does give me even further hope that we can quickly fix these problems; they are only happening with one partnership here and there, and others are ignoring the unexpected behaviors. That’s another thing that kiddos are getting so much better at by this point in the year–focusing on their own work and not joining in on the silly things their friends choose to do instead of what they’re supposed to do. Don’t get me wrong, they might notice–and even invite their friends back to work or remind them of what to do instead–but then they get back to their own thing and carry on. I love my job. I love my school. I love my principal. She has such a great way of making meetings so relevant and useful, usually showing us strategies that we could replicate in our classrooms the very next day. There are actually many meetings I go to around our district that are like that. It’s kind of refreshing. 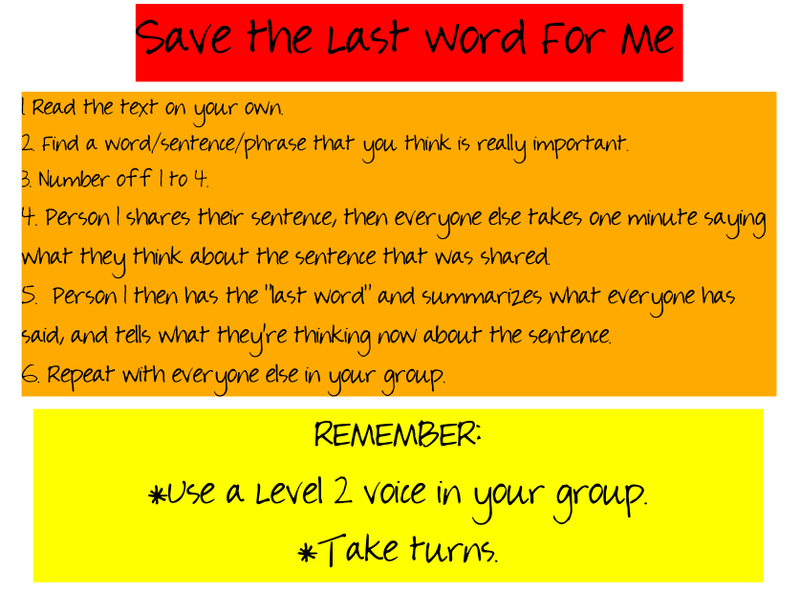 So when we were taken through the protocol for discussing an article called “Save the Last Word For Me” on Friday, I decided that this time I would try it with my class. I teach 5th graders, after all–and amazing ones at that–so I knew they’d do great things with it. Overall, most groups did a great job, and most were able to dig a little deeper by hearing other people’s perspectives on what they had individually read first. Once we were finished, we debriefed and they shared what was hard for them about trying something like this for the first time. I heard them share the very same things that were hard for me as an adult reader and listener the first time–talking for the whole minute when it was my turn (that’s a lot longer that you realize when you aren’t sure what to say! ), stopping when the minute was over (it’s a long time unless you have a really good idea to share, and then it’s AMAZINGLY short! ), and only talking when it’s your turn (which is only once during each cycle of sharing). That last one didn’t surprise me, because I have a class of talkers. Or maybe I should call them arguers. No, debaters. And during this protocol, you are not allowed to comment on other people’s ideas unless you’re the next one in the circle. Anyway, they have important things to say and we’re all working together on finding the appropriate times to share our important thoughts. Like I said before, I am always learning new things in my job as an adult learner, and when I can share those experiences and ideas with my kids, it’s a double bonus. We’ll use this one again, for sure, and I’ll be excited to share with you how it goes. So have you heard of protocols before? Have you tried this one? What other ways do you use in your classroom to facilitate conversations around a text?